From Super Monkey Ball to Marble Madness, from Kororinpa to Kula World, there’s something about rolling a ball that’s apparently irresistible to gamers and developers alike. One such game in this vein is Marble Blast, a PC franchise that became well loved for its cool courses and tight physics-based gameplay. Perhaps the best known entry to console gamers is Marble Blast Ultra for Xbox Live Arcade, which owners of early Xbox 360 systems surely remember from the demo that came pre-loaded with the console. Unfortunately, that game was delisted in 2011 and fans have been left without a great marble rolling simulator for years… until now. 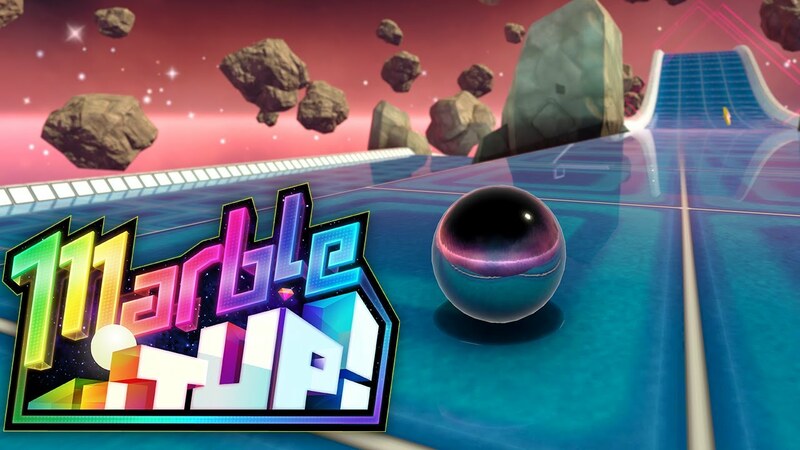 Enter Marble It Up!, a spiritual successor to Marble Blast Ultra that seeks to return the ball-rolling genre to its former glory. The gameplay is simple: you control a marble and must use any means necessary to reach the end of a variety of bizarre courses. While this can usually be achieved by simply rolling and jumping to the end, you’ll occasionally be gifted some nifty power-ups like a super jump, super speed, and a hover ability to help you see things through. Some levels will require you to collect a certain number of gems before the exit will open, but that’s about as complicated as it gets. Unlike similar ball-themed games, this is less about challenging your skills with soul-crushing level designs and more about seeing how much you can break them. If you purchase this game with no intent other than to see the ending, you’ll likely walk away disappointed. Simply clearing each stage isn’t particularly tough even in the later levels. This is definitely a game for the completionists and speedrunners out there seeking another epic ordeal to fill the marble-shaped hole in their lives. Many levels contain a hidden trophy that unlocks one of many alternate skins for your marble, and make no mistake – these are some well-hidden collectibles. You’ll likely only find a couple on your first playthrough unless you’re actively looking for them. It’ll take some replays and a lot of skill to nab these trinkets, especially since many of them are placed in precarious positions that will lead to more than a few deaths. Trophies may provide some longevity, but time trials are where the real meat of the game lies. Each level will rank you on your performance with a medal. Getting a bronze is guaranteed. Getting a silver is child’s play. Getting a gold may take some effort. But getting a platinum medal? Good luck. Even the very first level doesn’t fool around when you’re going for the best possible ranking. Thankfully, you can watch replays of the top five players on the leaderboards to discover their tricks, as well as race their ghosts. Graphically, Marble It Up! is a clear example of low budget visuals done right. Running at a rock solid 60 FPS, these are some slick-looking environments, with my favorite easily being the 1980s inspired stages that perfectly compliment the chill electronic soundtrack. If there’s any complaint to be made about this otherwise stellar package, it’s that with just 40 levels you’re left wanting more… but wait – there IS more! The good news is threefold: there will be a developer-made level pack coming in the near future, multiplayer will be added in a future update, and a level editor will be made available for PC players, with the best user-made levels to eventually be curated and bundled into level packs for console players to enjoy. Best of all, these updates will be free. If that’s not top-tier long term support, I don’t know what is. Marble It Up! is an excellent physics platformer that offers everything fans of the marble genre (I can’t believe that’s a thing) could want. With beautiful graphics, a synth-infused techno soundtrack, finely-tuned gameplay, and the promise of free DLC in the future, this is one game you won’t want to miss.